Born November 2, 1922 in Winnipeg, this defenceman enjoyed a 20-year hockey career which included NHL stints with the Toronto Maple Leafs, Detroit Red Wings and Chicago Black Hawks. He played in the MJHL with Winnipeg Rangers, 1941 Memorial Cup champions and the 1944 USHL Quebec Aces, Allan Cup winners. 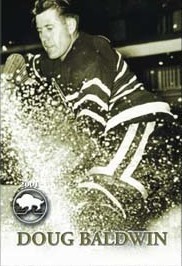 He also played on the 1947 USHL championship team, Kansas City Pla-Mors and with Brandon Wheat Kings in 1955 who were Western Canada intermediate champions. Doug Baldwin's pro statistics were 451 games played, 77 goals, 201 assists and 278 points.